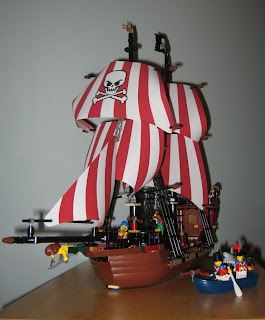 This year Lego returned to the classic Pirate line, releasing a handful of new kits with pirate themes. I was pleased to see that the Canadian prices for these kits was roughly on par with the exchange rate, give or take a few bucks, and doubly pleased to see these kits on sale at Sears for 15% off (actually, all toys were on sale). 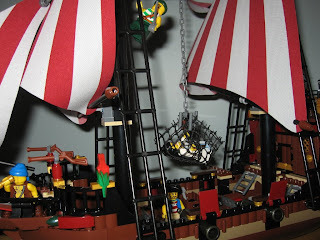 So, I picked up the 6243 Brickbeard's Bounty pirate ship. Brickbeard is the bad guy of the pirate line. He is basically your stereotypical "pirate" character; he has a hook for a hand and a peg leg and an eyepatch. He also wears a skull and crossbones hat. He comes with an assortment of pirate henchmen to raid the seas and torment the good guys. 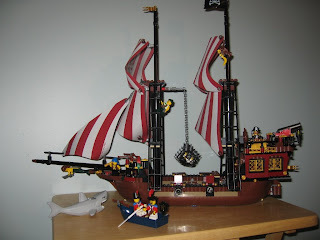 While building this set I was often thinking back to the pirate ship my brother had as a child. His was the good guys ship and thus it was smaller than Blackbeard's ship of the day. The modern ship is bigger yet and it's interesting to see how the building techniques and the materials have advanced over the years. For one thing there are fewer parts that are ship-specific. The mast pieces are now standard pillar pieces and the rigging is a standard ladder shape that can be easily re-used for other things. The ship itself is still made up of several large hull pieces, but these pieces are more modular than they used to be, allowing for even bigger ships to be made should you ever get your hands on two of these. 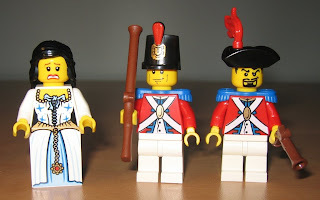 The minifigs are also significantly improved over the old days. 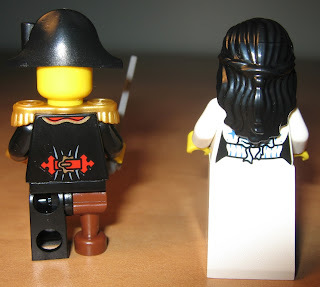 Their torsos are now painted on both sides and the maiden minifig has a two-sided head, so that she can be either screaming or happy. There is also lots of attention to detail; one of the pirate figs even has a gold tooth. 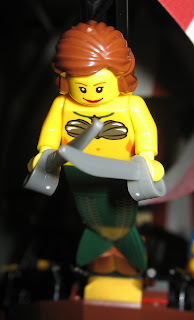 Aside from the minifigs, the ship itself has many unremarkable pieces. This isn't a bad thing; those pieces are the versatile ones. Building it was super easy; in fact the instructions seemed especially simplistic. I guess this is aimed at the younger builders but I'm used to more complex instructions. That's ok, though; a skilled builder can put it together in about an hour and a child should be able to do it unassisted in a few hours. And it's worth the wait. The ship is quite large and has a captain's cabin with a removable roof for easy play. 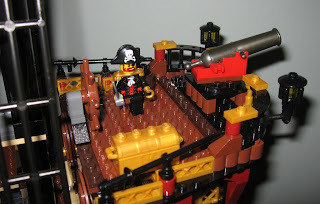 There are three cannons that can fire the round 1x1 cylinder bricks, including one placed rather dubiously on the stern of the ship, right where the captain stands. I guess Lego cannon don't need to pay attention to Newton's Third Law. Aside form the stern cannon, and the usual Lego design foibles (platforms that have no stairs to reach them, rooms with only three walls, etc), one amusing bit of nonsense is the mounted rifles. Did I say rifles? Of course these are muskets, in keeping with the era. It's a bit funny to see a musket mounted on the front of a rowboat, for example. For one thing, if a musket is pointed downwards the ammo can actually fall out. As well, a musket has only one shot in it before it must be reloaded, and this is always done with the musket in a vertical position. Therefore these mounted muskets are pretty strange. I guess most kids won't notice but it is a bit odd, and I wish Lego could impart some historical lessons alongside the "historical" sets. 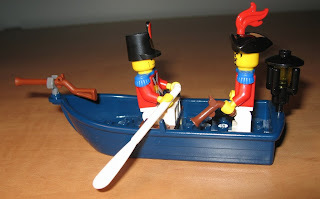 The rowboat itself is also rather funny because it's rather implausible that the redcoats would be rowing up to the ship; a stealth mission might work but those white pants, bright white oars, and the frickin' lantern might be a bit of a giveaway. Plus one of the redcoats isn't armed well enough. You can always redistribute the weapons any way you like, but according to the instructions that soldier only has paddles and that mounted musket. Some other details I noticed: there are some new shades of brown in this set that I've never seen before; they are very nice shades and I hope to see more bricks in those colours; the shark piece of old has been replaced with a much bigger, meaner-looking shark; the old shark could fit a single brick in his mouth; the new shark can swallow a whole minifig. The cannons are no longer dark grey but instead a super-dark grey that is almost black. It is another new colour and I like it a lot. These pirates are particularly brazen about their treasure hoard; even the treasure chest is gold and it's stored on the top deck by the steering wheel. My only complaints about this set are regarding how the sails are attached. The old ships used one-stud wide plates to form spars which had pegs to mount the sails. This led to a robust sail attachment system. This ship uses technic tubes for spars. This is much cheaper, and requires less building, but leads to a rather fragile sail configuration. Aside from that, my only minor nitpick is that I find the use of all these different coloured pieces here and there a bit annoying. On a set like this it would be nice if there wasn't a single blue brick or even light-grey. But true to Lego form, there are lots of odd-coloured pieces all over the place. Lego says this makes it easier to assemble the model, but I find it distracting and I wish Lego kits had more uniform colour schemes. However once the model is assembled you don't notice it too much. Overall I recommend this kit. If I ever find time I'll dig up my brother's old ship and do a detailed comparison. Before Christmas I tried to build my own bear. The results weren't as good as I'd hoped and so I tried again later. This time things went much more smoothly, mainly because I was slightly less ambitious. The first bear didn't turn out because the fur texture is fiendishly difficult to do well. Since this cake is all about the presentation, I decided to go with an easier fur texture and used mocha icing instead of sugar fur. This recipe makes a lot of icing but I find I use a lot when covering this bear. For one thing, there is a lot of surface area to cover. Also, if you make a mistake later on it helps to have spare icing to patch things up. Finally, there will be icing left over which can be added onto the cake pieces. This bear is quite big and the cake slices tend to not have much icing on them. It's nice to be able to add a bit of extra icing. The standard recipe on the back of the box calls for vanilla buttercream icing to glue the cake halves together. I find that this works but it's better to use the same icing on the outside as on the inside, so that you don't have too many icing flavours on the go. For decorating, I used some white icing for the inside of the bear's ears and some other details, and some chocolate chips melted with some butter for some of the other details. The bear turned out not bad, and all that icing goes well with the relatively dry bundt recipe.